How Much Does Grand Canyon Skywalk Cost? One of the best places inside the Grand Canyon area to visit is the newly built Skywalk. Lots of men and women who have visited the Grand Canyon have often noted the Skywalk as the highlight of their trip to the iconic area. Hence, it goes without saying that anyone who is looking to have the best possible experience at the Grand Canyon should go ahead and experience the Skywalk located on the western side of the Canyon. This article will go into the details of the Skywalk and the Grand Canyon Skywalk price. Firstly, actually getting to the Skywalk can be somewhat of a ordeal if you don't know what you're doing. Almost all the people that come to visit the Grand Canyon come in from areas such as Phoenix and nearby towns in Arizona. Normally, if you head straight to the Grand Canyon from these places in Arizona, you will end up in the south rim of the canyon. The Skywalk is located in the western side of the canyon, hence following the proper directions to end up in the western side of the canyon and not the south is very important for visitors before they make their trip to the canyon. The western side of the Grand Canyon has been renowned for having some truly majestic views of all of the most popular areas of the canyon. Furthermore, this is made possible thanks to the great development of the Skywalk in the western area. After years of planning and development, the Skywalk was built. This walk is a truly amazing feat of human design and technology. 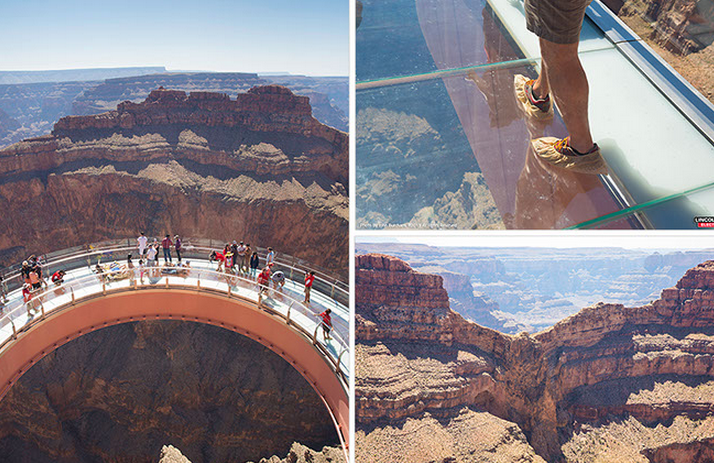 it is a completely transparent walkway which curves from beginning to end, off of a very high cliff in the western rim. This means that it will feel like you are walking on air as you get to see some of the best views that the entire canyon has to offer. Indeed, it's a majestic experience to feel like you're simply floating in the middle of canyon, experiencing everything that it has to offer. Entrance into the Skywalk is included with the Hualapai Legacy Gold package. Entrance into the entire area around the Skywalk is provided by purchasing a Hualapai Legacy package. The Hualapai people are the Native Americans that own the rights to this part of the Grand Canyon. The Skywalk is not included in the basic Legacy package, hence, to see the Skywalk you will need to purchase the Legacy Gold package. This package costs around $90 and includes lots of other great attractions in the area. The money you pay is well worth it, seeing as the Skywalk is a truly revolutionary way to experience the Grand Canyon. That is essentially all the information that you need to know about the Skywalk Grand Canyon price. Really going ahead and paying the extra money to experience the Skywalk is truly worth it. The Grand Canyon is usually a once in a life time experience for most people, so make sure to make the most of it. If you're going to visit the Skywalk, have the best experience in the Grand Canyon with one of our amazing rafting trips.